A great data science tool that was initially created for Python is Jupyter Notebook. I like to think of it as a really sophisticated console combined with REPL programming. A notebook is a sequence of cells. Each cell may contain code, that can be executed and its output displayed right after the code. The context is kept from cell to cell i.e. variables declared in the first cell can be accessed from subsequent cells. The magic is in that while consoles can only display character based output, notebooks can display visuals, such as HTML, SVG and images. This is extremely important with data science where visualization is key to understanding the data. Notebooks, when used in data science, typically display tables, graphs and other data visualizations. It cannot be done using plain old command line. You can download the notebook in various formats (HTML, PDF etc.) and share them. You can view an HTML download with the code in this post here. We are done with the introduction. Let’s start coding. First, we will need to install the Jupyter Notebook. This is a Python based web server used to manage, create and use Jupyter notebooks. The notebook’s interface is web based. You can find installation instructions over here. Note that the recommended installation method is using Anaconda. Anaconda is a Python package management and distribution tool. Jupyter is included in the Anaconda distribution. and the text will appear in your notebook. As you can see, the output is printed after the code cell. We will need the dstools package in order to run this tutorial. The package should be installed from the same directory of the notebook. Simple install it using npm. Editing a notebook is pretty straight forward. You can use buttons, menus or shortcuts. Executing the selected cell is done using Ctrl+Enter. If for some reason the kernel is stuck or you just need to restart the kernel, use the Kernel menu item for restart. If you wish, you can view, download and run this notebook on your own computer. The notebook is on github or you can view the static HTML download. Data Science doesn’t mean much without the data. In this tutorial we are using the House Prices dataset hosted by Kaggle. Download the train.csv file from https://www.kaggle.com/c/house-prices-advanced-regression-techniques/data. Have a look at the data fields description to better understand the data. Download the file and store it in your file system. Most datasets are stored in csv format. We will use the dstools package to load the data. The ds.Collection function creates a collection wrapper object. The various dstools functions can then be chained to the wrapper object, just like jQuery functions are chained to the jQuery object. We are using here the loadCSVfunction to load the data. It is stored inside the wrapper as an array of objects, each object representing a data point. The objects properties are the data point features (or fields). It is useful to view the first few rows to get a feel for the data. The head function returns a collection with the first n rows. the show function displays the data table. Each row is a data point representing a house sale. There are quite a few fields (features) for each data point. The most important field is the last one, SalePrice. A description of the data fields can be found in the “data description.txt” file in the data repository. Some fields are quantitative, i.e. they have a numerical value, like SalePrice. Others represents categories like PavedDrive which can be one of Y (yes), P (partial) or N (no). A description of the possible categories for each field can be found in the “description.text” file. Next, we want to better understand the house price feature of our data collection. A significant concept in statistics is distribution. probability distribution is a mathematical function that, stated in simple terms, can be thought of as providing the probabilities of occurrence of different possible outcomes in an experiment. For instance, if the random variable X is used to denote the outcome of a coin toss (“the experiment”), then the probability distribution of X would take the value 0.5 for X = heads, and 0.5 for X = tails (assuming the coin is fair). First, we will use the dstools function describe to get some basic understanding of the HousePrice distribution. The describe function shows the most important distribution measures. We can see the mean value is about 180,921 with standard deviation of 79,415. The quartiles gives us a better understanding of the prices the bulk of the houses were sold for. 50% of the houses were sold for prices between 129,900 and 214,000 (between the 25% and 75% quartiles). The describe function gave us a general idea of the distribution, but we would really like to visualize the distribution. Seeing is believing is understanding. We use histograms for that. 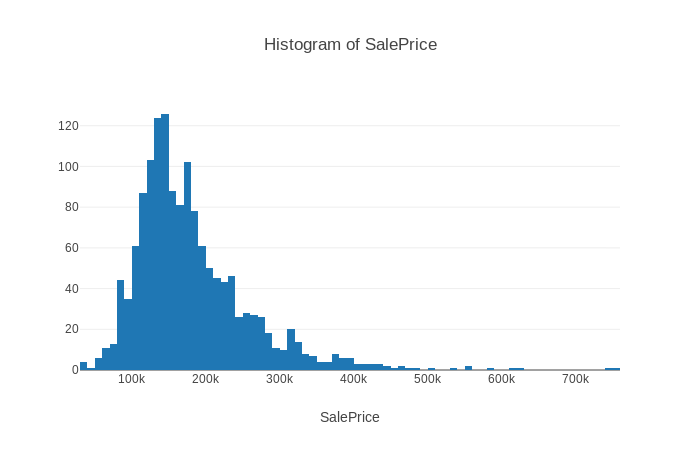 The histogram sorts all house prices and puts them in bins. Each bin represents a range of prices. The Y axis shows how many data points are in each bin. The dstools module provides convenience functions for all visualizations in this tutorial including histograms. The histogram function takes one argument, the name of the field to show in the histogram. In probability theory and statistics, skewness is a measure of the asymmetry of the probability distribution of a real-valued random variable about its mean. The skewness value can be positive or negative, or undefined. Skewness value of 0 means the distribution is not skewed. A negative skewness indicates that the distribution is left skewed and a positive skewness indicates the distribution is right skewed. We can measure skewness using the skewness function. Skewness is a primitive value (number), so there is no need to chain the show function. The higher the value, the more data points are in the tail and the tail is longer. Normal distribution has the value of 0. It is possible, of course, to show histograms of categorical fields such as PavedDrive. 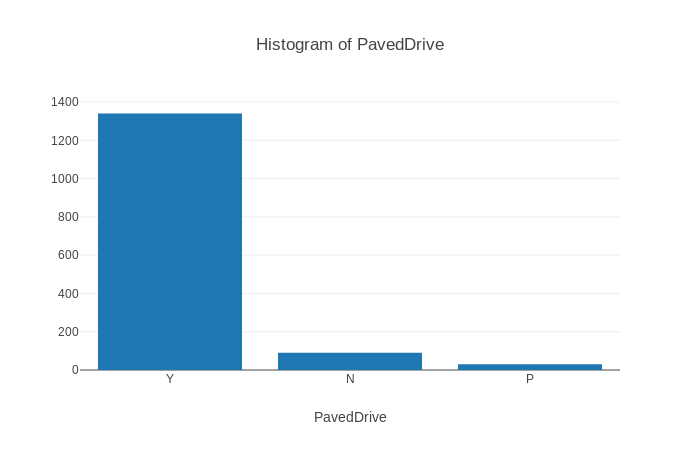 The histogram will show the number of data points with each PavedDrive category. Not surprisingly, almost all sales were of houses with paved drives. So we understand now the distribution of house prices, but we are really interested in exploring the relationships between the different features. We want to understand how the prices of houses relate to other features such as Lot Area, the year the house was built or if the house has a fireplace. In statistics, dependence or association is any statistical relationship, whether causal or not, between two random variables or bivariate data. Correlation is any of a broad class of statistical relationships involving dependence, though in common usage it most often refers to how close two variables are to having a linear relationship with each other. Familiar examples of dependent phenomena include the correlation between the physical statures of parents and their offspring, and the correlation between the demand for a product and its price. Correlation can be in the range of -1 and 1. A value of 1 means the features are positively correlated i.e. they move in the same direction. Zero correlation means the featurs are not related. Negative correlation means when the value of one feature rises, the value of the other feature falls. Positive correlations are in red. Negative correlations are in blue. The correlation between two identical features is always 1. You can see that in the map with the diagonal red line. From the correlation map we can see that “Total basement area” and “first floor area” are positively correlated. This is because the basement is usually on first floor. The features “total room above ground”, “living area” and “overall quality” are positively correlated with “sale price”. The largest the living area, the more expensive the house is. The feature “year built” is negatively correlated with the feature “enclosed porch area”. This means, newer houses have smaller porches. 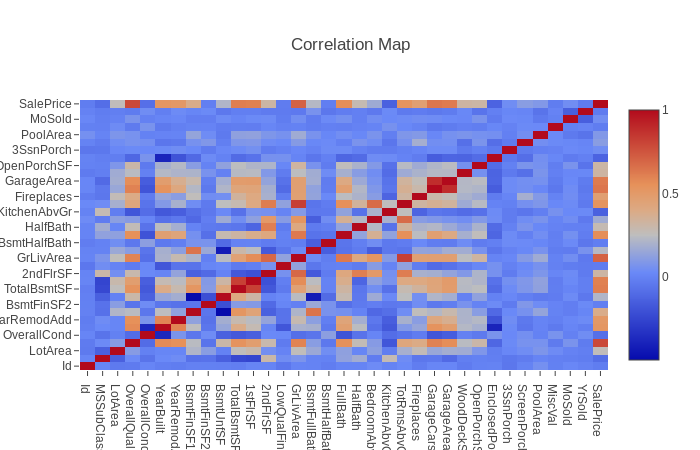 Correlation maps are great at directing our attention to interesting relationships between features. We use the scatter plot for understanding the nature of the relationship between the features. We noticed the correlation between living area and house price. Let’s view a scatter plot of the two features. The X axis represents SalePrice. The Y axis, above ground living area. The correlation is now clear. 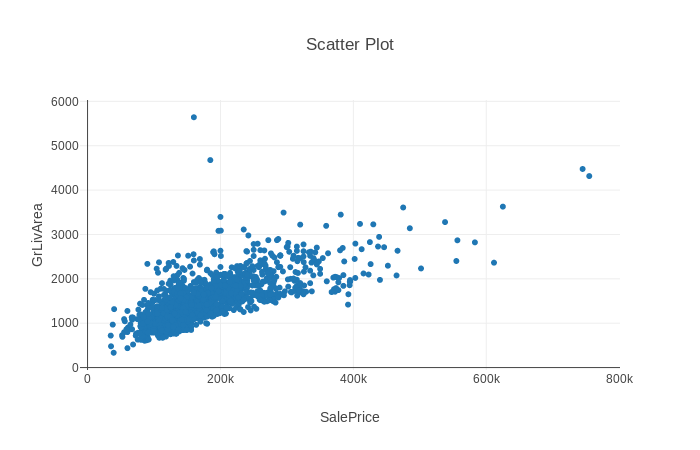 You can image a line representing the relationship between sale price and area. You can also see the specific points that are distant from the line, like the two points between 100k and 200k at the top. These data points do not follow the general rule. Scatter plots are good for comparing two continuous features but less so for categorical features. 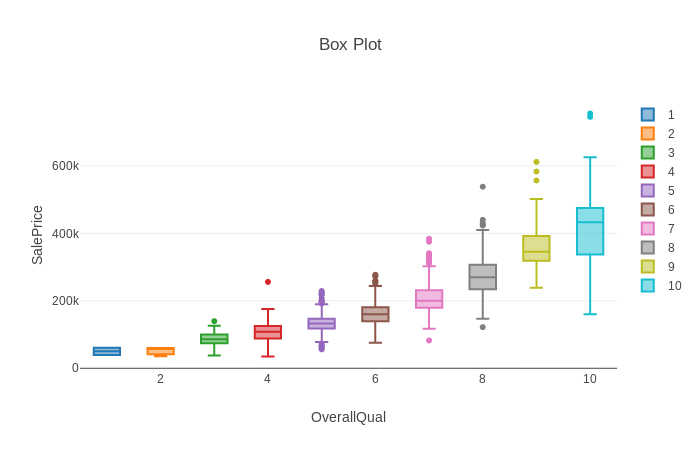 We can use the boxplot for that. In this example, each box represents all data points with a particular quality score, between 1 and 10. The line in the center of the box is the median. The bottom box border is the 25% percentile and the top box border is the 75% percentile. This gives us a good idea of where 50% of the data points are (inside the box). The whiskers represent the maximum and minimum values, excluding outliers. Outliers are data point that are significantly distant from the rest of the data (more than 1.5 X interquartile range above or underneath the box). They are rendered separately. You can see, data points with overall quality of 8 have 4 outliers, 3 above the top whisker and 1 underneath the bottom whisker. 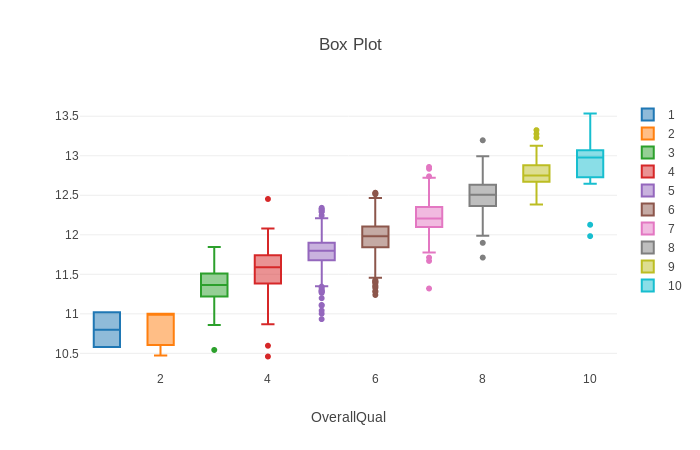 Read here for a more detailed explanation of box plots. Notice that connecting the boxes creates an imaginary line, but the line is not straight. It is more like a log line. This indicates that the relationship between the two features is not linear but more like log. We can plot the log of the sale price instead of the actual sale price replacing the string SalePrice with a function. Now we can see the boxes are closer to an imaginary straight line.